March 21st, 2018, 6:30pm: Peachland Sportsmen Association. Free & open to the public. Located at the Peachland Community Center. Seminar “Kokanee 101: Targeting Tactics & Presentations”. No Registration Required! 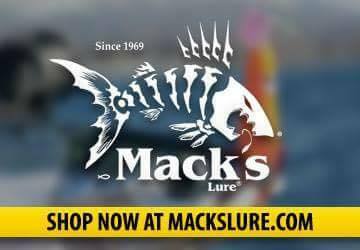 March 29th, 2018, 7:00pm: Trout Waters Fly & Tackle, 2340 Hwy 97 N #101, Kelowna BC. Free & open to the public. Seminar: “The Basis of Kokanee Fishing” Registration is required by emailing Danny@BCFishn.com. April 6th, 2018 5:30pm: BC Interior Sportsmen Show, Kelowna Capitol News Center. Seminar is included with show admission. 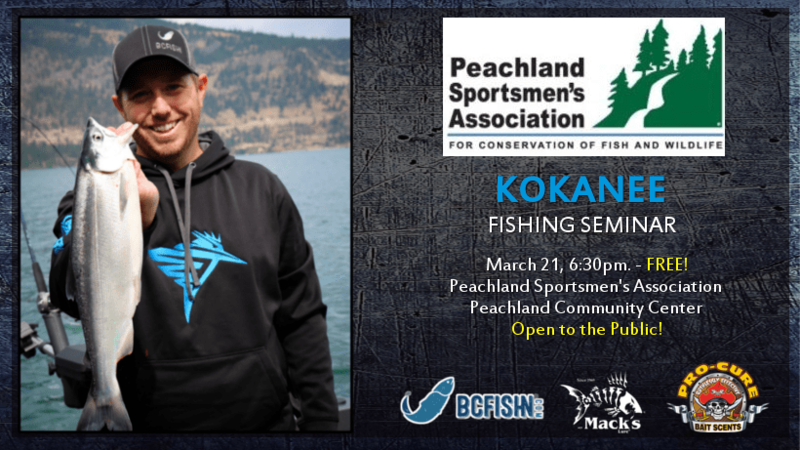 Seminar : “Kokanee 101: Targeting Tactics & Presentations”. No Registration Required! April 7th, 2018 11:30pm: BC Interior Sportsmen Show, Kelowna Capitol News Center. Seminar is included with show admission. 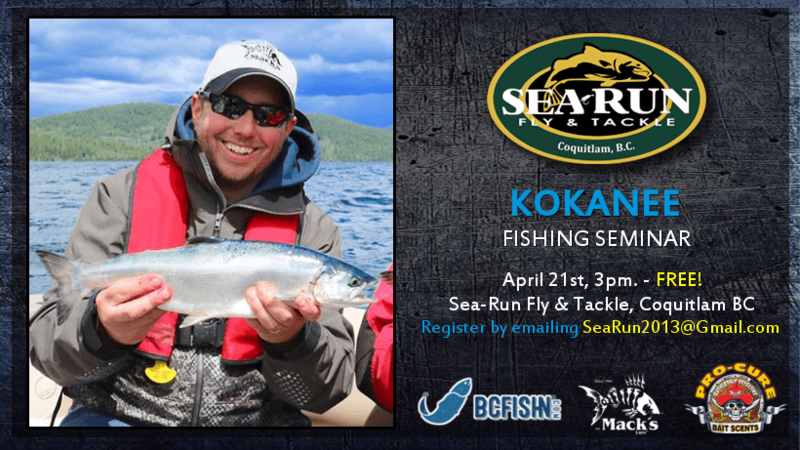 Seminar : “Kokanee 101: Targeting Tactics & Presentations”. No Registration Required! April 8th, 2018 11:30pm: BC Interior Sportsmen Show, Kelowna Capitol News Center. Seminar is included with show admission. 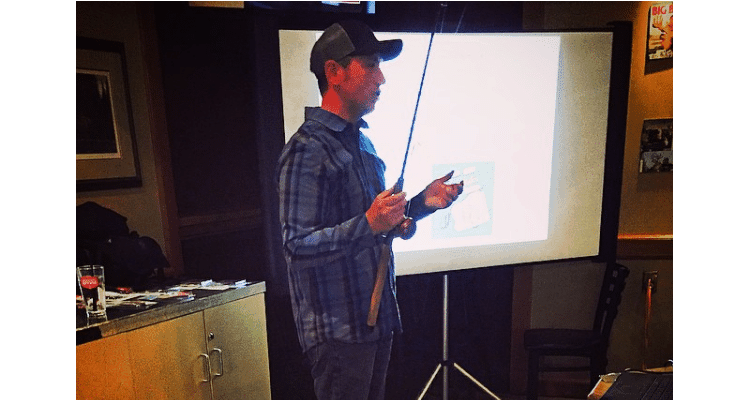 Seminar : “Kokanee 101: Targeting Tactics & Presentations”. No Registration Required! 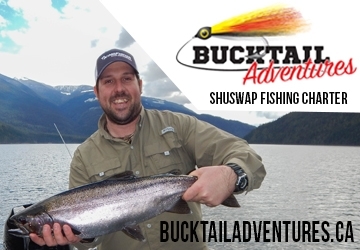 April 21st, 2018, 3:00pm: Sea-Run Fly & Tackle, 1140 Austin Ave, Coquitlam BC. Free & open to the public. Seminar: “The Basis of Kokanee Fishing” Registration is required by emailing Danny@BCFishn.com. Want to book a fishing Seminar? Here is what we offer! Is your club, organization or show interested in improving their fishing knowledge? Contact the BC Fishn Team regarding one of our fishing seminars! 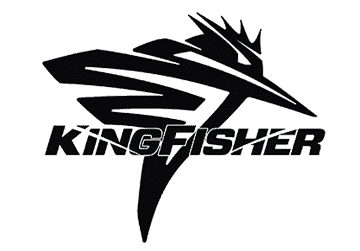 Our team is made up of experienced Pro Staff Anglers in a variety of fishing methods and various angling topics! We can customize a presentation to fit your group’s needs. Whether it’s Kokanee Fishing, Fly Fishing or even Bass Fishing we can work with you to find a seminar that fits your needs! 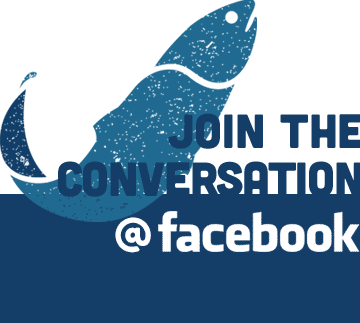 BC Fishn is partnered with a variety of angling experts to help deliver cutting edge fishing seminars for all levels of anglers and angling topics! 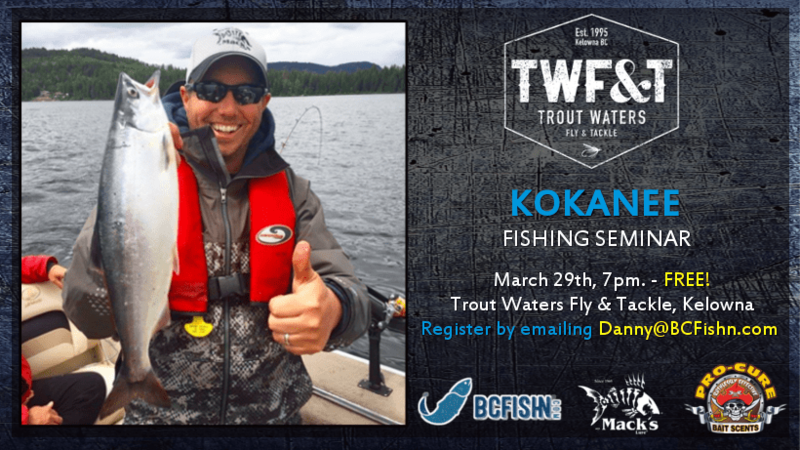 The Basis of Kokanee Fishing – Presenter: Danny Coyne: This seminar is intended for anglers that are new to Kokanee fishing or to experienced anglers that want to refresh and upgrade their Kokanee angling skills. Discover the basis of Kokanee fishing as you learn where & how to locate Kokanee, tackle & gear tips, & trolling methods which will help put more Kokanee in your boat! 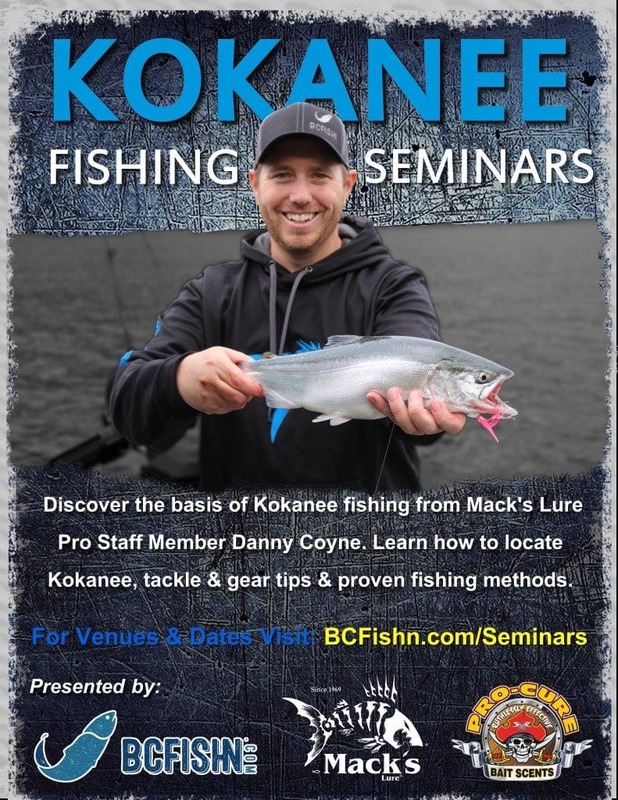 Advanced Kokanee Fishing – Presenter: Danny Coyne: This seminar is geared towards the experienced angler that would like to up their Kokanee game! 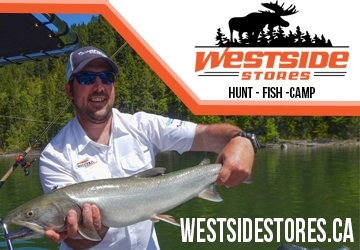 Further in-depth fishing tactics, tackle rigging and proven Kokanee fishing methods are covered in this seminar. Angling 101 – Presenters: Danny Coyne or Matt Benson: This seminar is for the amateur beginner angler. We take the group through the basic “How To’s” of fishing to help you get started! We review how to properly read and understand the fishing regulations, identify fish species, basic fishing knots, explain fishing tackle and rods/reels and fishing techniques. The Basis of Ice Fishing – Presenters: Danny Coyne & Matt Benson: Throughout this seminar we take the group through the basis of ice fishing. We review fishing regulations specific to ice fishing, ice safety, ice fishing tackle & gear and proven ice fishing methods for a variety of game fish. Bass Fishing 101 – Presenter: Matt Benson: If your group is interested in learning the ins and outs of Bass fishing then this is the seminar for you! You will earn the about Bass fishing tackle & gear, how & where to target Largemouth & Smallmouth Bass throughout the year and proven bass fishing techniques. 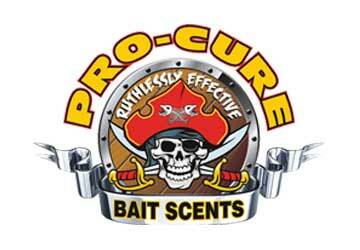 Custom Seminars: The BC Fishn Team will work with you to customize a seminar for your group. We can help build a seminar on the specific fish species and angling method that you are looking for. The BC Fishn Team is partnered with a variety of angling experts that will help us create the perfect seminar for what your group is looking for!